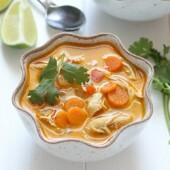 Easy and flavorful slow cooker coconut lime chicken soup. A perfect dinner for any night of the week! Prepare vegetables and trim chicken of any fat. Place vegetables, chicken, spices and chicken broth in a 5-6 quart slow cooker. At the end of the initial cook time, whisk coconut milk until smooth and add to slow cooker. Stir gently until well combined. Cook or an additional 30 minutes. Prior to serving, stir in lime juice.